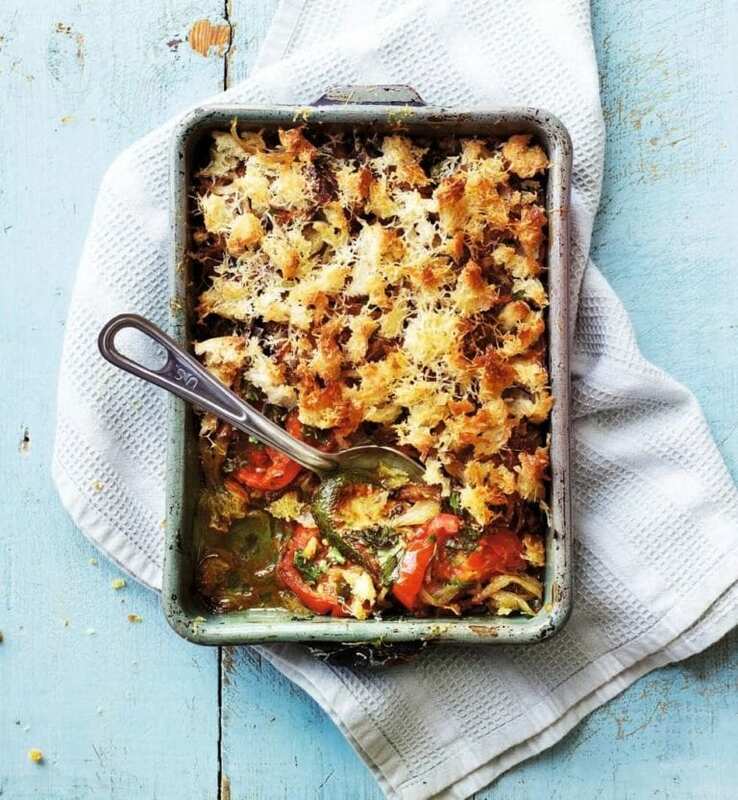 The taste of courgettes and tomatoes shines through in this crispy gratin recipe. Serve with a simple salad for the perfect summer supper. Heat the oven to 210°C/fan190°C/gas 6½. Cut the courgettes diagonally into 0.5cm slices. Heat a large frying pan with a splash of olive oil, then fry the courgettes in batches for 2 minutes on each side or until golden. Thickly slice the tomatoes, then put them in a 1.2 litre ovenproof dish with the fried courgettes. Drizzle with olive oil, season, then roast for 20 minutes or until the tomatoes are shrivelled. Meanwhile, finely chop the onion and finely chop the anchovy fillets, then fry in a little olive oil over a medium-high heat for 5-6 minutes, stirring, until golden. Roughly chop the fresh basil, oregano and parsley, then scatter over the roasted vegetables. Top with the onion mixture. Tear the sourdough bread into small pieces, then scatter over the gratin with a good grating of parmesan. Cook for 5-10 minutes until golden.